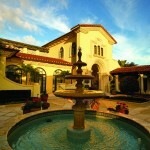 Now that the Season has officially arrived in the Palm Beaches, the activities at Old Palm Golf Club are nonstop. There are celebrations, exuberant parties and entertaining activities day and night. Nowhere is this more evident than at the intimate Club, a veritable hub of the social scene. âOur members are passionate about the Club and love participating in the activities at Old Palm, says Darlene Impellittiere, General Manager. âEach week, there is an abundance of social events, so no matter what our members are interested in there are plenty of options.â For instance, Valentineâs Day is this weekend so the Club will host an exclusive, much-anticipated dinner dance for the occasion. Itâs always one of the Seasonâs loveliest affairs. Of course, there is a multitude of other social opportunities throughout the week. Members often start their day at the Clubâs extraordinary fitness center, where classes might range from group Zumba to Pilates mat to TRX fitness, which uses suspension training for a total body workout. For those who prefer to follow their own schedules, the Spa within the Club beautifully accommodates with a variety of indulgent treatments that include massages, facials and salon services for men and women. Wednesdays often have their own flair. This Wednesday, the Ladies Book Club will meet in the Clubâs inviting Womenâs Lounge to discuss Anthony Doerrâs bestseller âAll the Light We Cannot See.â Later in the day, members will gather for Pub Night, a light-hearted casual get-together that often spills onto the Event Lawn for some enthusiastic bungee jumping. âOld Palm is the premier private Club community in the Palm Beaches, yet the atmosphere is anything but stuffy or reserved,â adds Impellittiere. âWhatever the occasion, first and foremost, itâs fun and even our newest members feel like family.â Often, activities are created to coincide with local events. Last weekâs Pub Night featured a drawing for members to play with some of the PGA Tour golfers who will be in town for the upcoming Honda Classic. Itâs sure to be a thrill for the members to tee it up with the pros, and exclusive one-of-a-kind events like this have become a hallmark of Old Palm. Golf is always a huge draw at Old Palm, as the communityâs spectacular golf course was designed by the legendary Raymond Floyd, who is also a member and Honorary Club Chairman. Weekend tournaments are frequent, giving members and their guests the chance to enjoy some friendly competition and win prizes. Formats include Scramble, Shamble, Stableford and Best Ball, so every tournament has its own character.